In a recent email, Vikas Menon writes: “while i’ve been reading a great deal of poetry, i realized i’ve been sorely negelecting texts on poetics — can you drop me a line when you get a chance on some texts that can act as guideposts to further reading?” I tried to do just that, writing down what quickly came to mind and easily to hand off the shelf. What struck me most compiling this brief list, sitting here in Albany & relying on my English-language library, was that it included very little non-North American materials — some fall backs on European Avant-Garde traditions, sure, but not much beyond (in Ed Dorn’s words) “some business recently transacted in the White World.” (Alcalay’s, Rothenberg’s, & some of my essays being the exceptions that confirm the rule). As if a poetics based on a single language & culture were still a valid situation. Especially when that culture is swaggering all over the place, imposing its “vision” — both culturally & politically — on the world at large. Of course the fact that much poetics material from other places & cultures hasn’t been translated or gathered into accessible books, can be seen as an integral part of yankee hegemonic strivings. My own limitations are also flagrantly visible, in terms of intra-North American ethnic poetics. So, I’ll reprint the list below, more or less in the randomish order in which I put it down for Vikas, in order to elicit responses, additions, suggestions, etc., while beginning to take notes toward that “other” list I think is needed to counter the all-too US-oriented inclination of this one. Of course one way to do this would also be to send Vikas — & the readers of this blog — back (or forward, as the case may be) to the Poems for the Millennium anthologies, which do carry a certain charge of poetics, in the commentaries and in the “Manifestos” section. Jed Rasula: Syncopations; The American Poetry Wax Museum; This Compost. Jerome Rothenberg: Pre-Faces & Other Writings. Lyn Hejinian: The Language of Inquiry. Nathaniel Mackey: Discrepant Engagement – Dissonance, Cross-Culturality, and Experimental Writing. Allen Fisher: Traps or Tools and Damage; Ideas on The Culture Dreamed of. 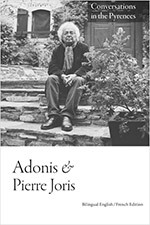 Pierre Joris: A Nomad Poetics. Ammiel Alcalay: Memories of our Future. Anne Waldman: Vow to Poetry. Don Byrd: The Poetics of the Common Knowledge. John Taggart: Songs of Degrees – Essays on Contemporary Poetry and Poetics. Alice Notley: Coming After – Essays on Poetry. Charles Bernstein: A Poetics; Content’s Dream; My Way. Charles Bernstein, editor: The Politics of Poetic Form. Michael Palmer: Code of Signals – Recent Writings on Poetics. Joan Retallack: The Poethical Wager. Mark Wallace & Steven Marks, editors: Telling it Slant: Avant-Garde Poetics in the 1990s. Christopher Beach, editor: An Anthology of New Poetics. Bob Perelman: The Marginalization of Poetry. Anne Waldman & Andrew Schelling, editors: Disembodied Poetics. Annals of the Jack Kerouac School. Ann Vickery: Leaving Lines of Gender – A Feminist Genealogy of Language Writing. Laura Hinton & Cynthia Hogue: We who Love to be Astonished – Experimental Women’s Writing and Performance Poetics. It might be interesting in this context to go back and read (or re-read) some of the manifestos of Vicente Huidobro, if only because the poetry he wrote forms such a wonderful match with his manifestos. I think there’s a real interpenetration in his work between theory and practice, which always strikes me as being a crucial question when one begins to develop a poetics. Also, his manifestos, like his poetry, are just a real delight to read. Octavio Paz? Many of his essays and lectures on poetry are available in English. His esthetic interests were always transnational. . . . Yes, indeed, both Huidobro (a book of his was btw just published by Green Integer) & Paz are interesting — more than interesting, in fact — in this context. Interesting also to note, in view of these being the first two names given here, that both are from the Latin Americas — the one literary area that adventurous Norte Americanos have indeed gone & explored (& translated from). Maybe it is also now time to go further, Africa, Asia, say — in a “both, and”, both the Americas, & the other continents, way. Don't know where to spend 4th July? Try London!